welcome to my brain . net: Aren't mom's supposed to do that? Aren't mom's supposed to do that? Last week the kids and I were hanging with friends. Their youngest crapped in her diaper twice in a matter of 30 minutes! ha! Well, they take turns with the stinky diapers. It was Daddy's turn. As he was whipping off the smelly and getting her cleaned up, one of my newer children looked at him with utter shock, then looked over at his wife and asked, "Isn't the Mom supposed to do that?" Well, all of the air sucked out of the room before my friend and I both asked, "WHAT?" He then proceeded to follow me into the kitchen and say, "But, Mom, when [Mac] and [Andy-Roon] were babies, didn't you do that stuff - cause you're the Mom??" He was befuddled. He was even more confused by MY utter shock. We've got some edumacating to do on parenting roles - or lack thereof. Well, sounds like maybe I should not go buy more Zestra--thanks for being my ginea pig. OK, so I have to know. 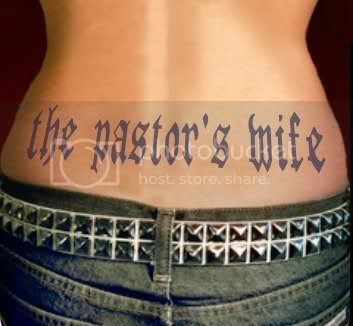 Is the pic of "the pastor's wife" tat you or not? At first I thought it was, but then after seeing a picture of your face in one of your posts (still not sure if you're the blonde with no lips or the brunette with no lips) I wouldn't guess either of you have that tat? OOh, that sounds judgementalish doesn't it? Not meant in a bad way though. I'm always worried someone's going to take a comment wrong. Enjoyed reading your blog-funny stuff. I like people who don't try to sound all...all...I don't know...all perfectly perfect I guess. Fawn, welcome to my brain ... er ... blog. Those who read me regularly will laugh at the "I like people who don't try to sound all ... perfectly perfect .." cause they know way more about me than they probably know about themselves (and some of it's sooooooo not pretty)! Well, and after the whole Zestra thing ... SO DO YOU!! ha! Anywho, it's not my tat. I have a nose stud, but I'm not fool enough to put permanent words on my lower back, which will just morph as I age, into God-knows-what. I've thought often of having a contest on my blog - if that WAS my tat, what would it actually say when I'm 70?? Your youngest and my husband are like minded. Unfortunately. Daddy's still wash the cars, plunge the toilets, and take out the trash though, right? In our house Daddy changes all the dirty diapers if he is home. My logic is that I put up with all the "doo doo" during the day--i.e. rages, hissy fits, crying, therapy, etc--so he can do his part when he's home. :-D He's cool with it. Brenda, you're not even a little bit funny!! depending on his history, though, it is sweet that he is processing that the mommy cares for the baby. Don't get me wrong, I'd be quick to say Daddies love to care for their babies, too, even with they stink!